This diagram shows how WiTricity Corp.'s highly resonant coupling works. When a highly resonant transmitting copper coil, connected to an AC power source (top, left), is tuned to the same frequency as a highly resonant receiving copper coil (bottom, left), the two coils exchange energy efficiently over distances via the magnetic field (right). Credit: WiTricity Corp.
More than a century ago, engineer and inventor Nikola Tesla proposed a global system of wireless transmission of electricity—or wireless power. But one key obstacle to realizing this ambitious vision has always been the inefficiency of transferring power over long distances. Near the end of the last decade, however, a team of MIT researchers led by Professor of Physics Marin Soljacic took definitive steps toward more practical wireless charging. First, in 2007, the team wirelessly lit a 60-watt light bulb from eight feet away using two large copper coils, with similarly tuned resonant frequencies, that transferred energy from one to the other over the magnetic field. Then, in 2010, they shrunk the coils down and significantly increased the efficiency of the system, noting future applications in consumer products. Now, this "wireless electricity" (or "WiTricity") technology—licensed through the researchers' startup, WiTricity Corp.—is coming to mobile devices, electric vehicles, and potentially a host of other applications. The aim is to forge toward a "wire-free world," says Soljacic. Primarily, this means consumers need not carry wires and power bricks. But it could also lead to benefits such as smaller batteries and less hardware—which would lower costs for manufacturers and consumers. "It's probably a dream of any professor at MIT to help change the world for a better place," says Soljacic, a WiTricity co-founder who now serves on its board of directors. "We believe wireless charging has a potential to do that." He is not alone. Last month, WiTricity signed a licensing agreement with Intel to integrate WiTricity technology into computing devices powered by Intel. Back in December, Toyota licensed WiTricity technology for a future line of electric cars. Several more publicized and unpublicized companies have recently joined in the licensing parade for this technology, including Thoratec for their implantable ventricular assisting devices, and TDK for wireless electric vehicle-charging systems. There's even talk of a helmet powered wirelessly via backpack, specifically for military applications. At present, WiTricity technology charges devices at around 6 to 12 inches with roughly 95 percent efficiency—12 watts for mobile devices and up to 6.6 kilowatts for cars. But, with growing research and development, the company is increasing distance, scale, and efficiency. It's also developed repeaters: passive devices that extend the distance of the power transfer. These can be developed into a wide variety of shapes and can be embedded in a carpet to "hop" the power across a room. Similar wireless charging technologies have been around for some time. For instance, traditional induction charging, which uses an electromagnetic field to transfer energy between two coils, is used in transformers and wireless toothbrushes. In the past two years, there's also been an increase in wireless cell phone charging pads based on induction. "These work well, but only over very short distances, so they're nearly touching," Soljacic says. "They become dramatically inefficient when the distance increases." Lasers can also move energy between two points, such as two satellites. But this requires an uninterrupted, continuous path between the transmitter and the receiver, which "is obviously not ideal for consumer products," Soljacic says. 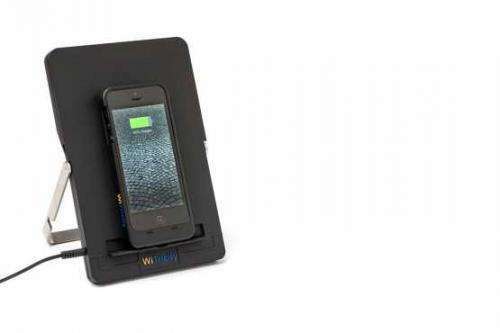 WiTricity Corp. recently unveiled a design for a smartphone and wireless charger powered by its technology. The charger can charge two phones simultaneously, and can be placed on top of a table or mounted underneath a table or desk. Credit: WiTricity Corp.
WiTricity's system of transmitters and receivers with magnetic coils, on the other hand, "efficiently transfers power over longer distances," says CEO Alex Gruzen '84, SM '86. "It can also charge through materials such as wood or granite, allow freedom to move the devices around, and charge several devices at once." 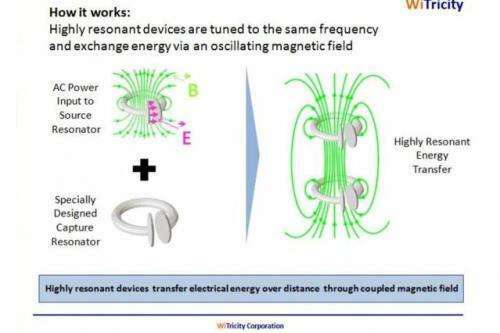 To make the system more efficient, WiTricity tunes the coils to find a strong electromagnetic highly resonant coupling. This is similar to a tuning fork vibrating when exposed to a sound of the right frequency, or a radio antenna tuning into a single station out of hundreds. The concept took shape in early 2000s, when Soljacic awoke at 3 a.m. to the beeping of his cell phone running out of battery life. Frustrated, and standing half awake, he contemplated ways to harness power from all around to charge the phone. At the time, he was working on various photonics projects—lasers, solar cells, and optical fiber—that all involved a phenomenon called resonant coupling. "The underlying physics could be easily applied to power transfer," he says. Seeing use for consumer devices, Soljacic and a team of five MIT researchers—including physics professors Peter Fisher and John Joannopoulos—published a proof-of-concept experiment in Science in 2007, and founded WiTricity that same year. In the experiment, the researchers used two copper coils, about two feet across, each a self-resonant system. One transmitting coil was connected to an AC power supply, while another connected to a 60-watt light bulb. The transmitter emanated a magnetic field, oscillating at megahertz frequencies, which the receiver matched, ensuring a strong coupling between the units and weak interaction with the rest of the environment, including nonmetallic materials—and humans. In fact, they demonstrated that they could light the bulb, at roughly 45 percent efficiency, with all six researchers standing in between the two coils. Gruzen uses the following analogy: A room is packed with 100 wine glasses, each filled with a different level of wine to ensure a different resonant frequency. "If an opera singer belts out a note inside that room, the glass with the corresponding frequency accumulates enough energy to shatter, but none of the other glasses will resonate enough to break," he says. A 2010 paper published in Applied Physics Letters by Soljacic and colleagues made another breakthrough: They found that when adding more receiver coils, power transfer efficiency climbs by more than 10 percent. In that experiment, they used larger transmitting coils, but receiving coils that were only a foot across, resulting in a power output of 50 watts from several feet away. 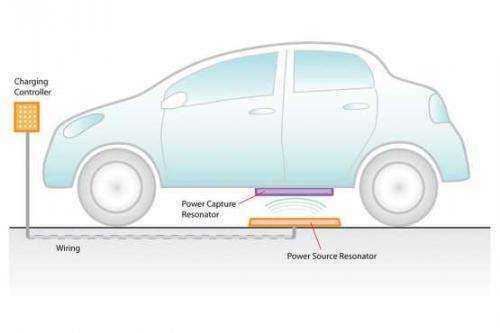 The WiTricity technology can charge an electric car, with the vehicle parked about a foot above the transmitting pad. Credit: WiTricity Corp.
"This enabled the development of a whole new category of magnetic resonance," Gruzen says. From there, the company focused on finding the optimum design of the coils and electrical control systems for commercial applications. These days, Gruzen sees wireless charging as analogous to the evolution of a similar technology—WiFi—that he witnessed in the early 2000s as senior vice president of global notebook business at Hewlett Packard. At the time, WiFi capabilities were rarely implemented into laptops; this didn't change until companies began bringing wireless Internet access into hotel lobbies, libraries, airports, and other public places. Now, having established a standard for wireless charging of consumer devices with the A4WP (Alliance for Wireless Power) known as Rezence, WiTricity aims to be the driving force behind wireless charging. Soon, Gruzen says, it will be an expectation—much like WiFi. "You can have a charging surface wherever you go—from a kitchen counter to your workplace to airport lounge and hotel lobbies," he says. "In this future, you're not worried about carrying cords. Casual access to topping off power in your devices just becomes an expected thing. This is where we're going." With an expected rise of wireless charging, one promising future application Soljacic sees is in medical devices—especially implanted ventricular assist devices (or "heart pumps") that support blood flow. Currently, a patient who has experienced a heart attack or weakening of the heart has wires running from the implant to a charger—which means risk for infection. "In our case, a patient could lie on the bed and, while he or she is sleeping, our technology could charge the device from a distance," Soljacic says. "We expect to have much more of these embedded electronic devices in people over the next decade or so." Just one question: What is its effectiveness? i dont want electricity from metal plate beneath my legs, i want distance electricity. 150 meters away..
"At present, WiTricity technology charges devices at around 6 to 12 inches with roughly 95 percent efficiency"
casual, what's the difference ? If you are worried about harmful effects, distance shouldn't matter.